With the news full of the horrors of ISIS and their genocidal war in Iraq and Syria, I thought I’d turn to a far more optimistic and inspiring episode of recent Middle Eastern history: how a group of Lebanese students in 1962 were inspired to join the nascent space race and begin building their own rockets. It’s a piece of history that has been all but forgotten. 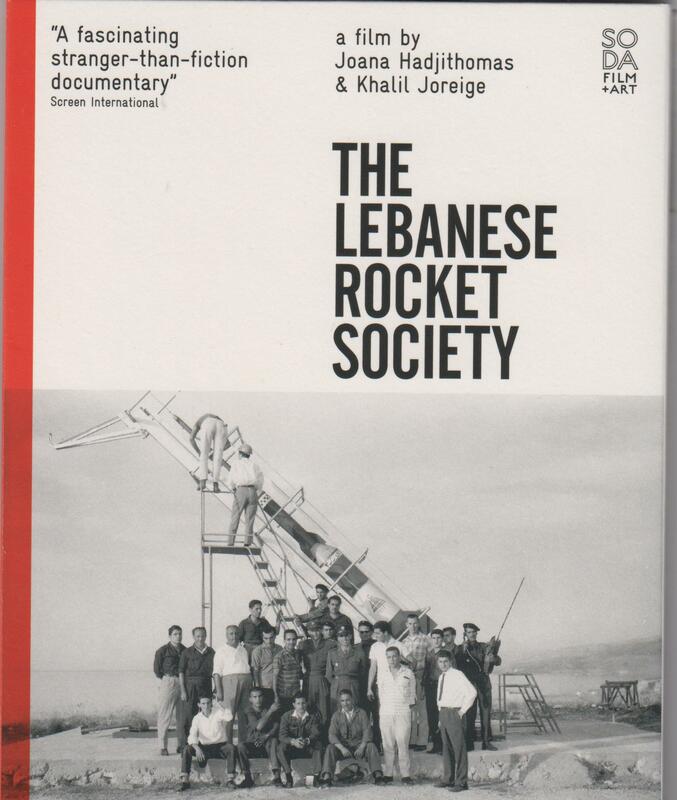 The film not only documents the rise and fall of the Lebanese space programme, but the film makers’ own attempts to jog people’s memories of it on Lebanese radio. They then turned the rocket programme into an art project, constructing a full-scale statue of one of the rockets, which they presented to the Lebanese Armenian college at the centre of the rocket programme. They also made their own version of the Golden Record, the disc containing the sounds of Earth, which was carried into space on the Voyager 2 probe destined to leave the solar system for the depths of interstellar space and possible contact with aliens. In the hands of the film’s producers, the record held the sounds of Lebanon. They also created an animated film, by Ghossein Halwa, depicting what Lebanon might be like in 2025, if the programme had continued. In Halwa’s film, the Lebanon of the near future is a prosperous, bustling space age state. Space technology has given the country security by allowing it to guard its borders against foreign invasion. It has also contributed to the country’s material wealth by discovering oil reserves off its coast. Beirut and its suburbs are a true, futuristic city like the vast megalopolis’ in Japanese manga films and the SF classic, Blade Runner. 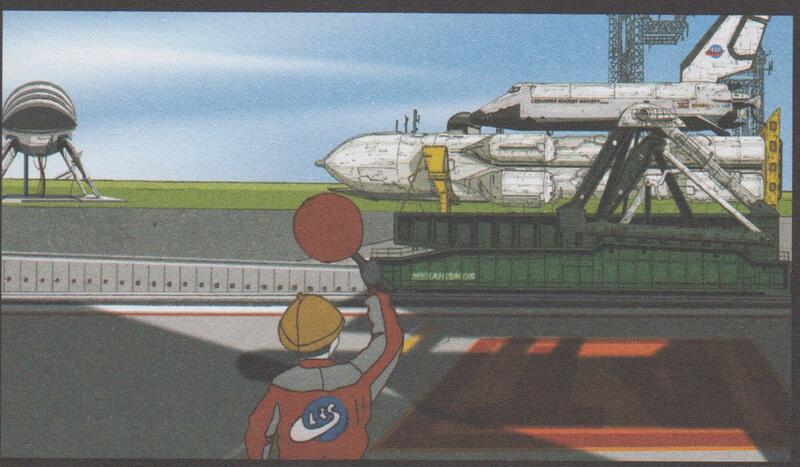 Vast space craft, Arab versions of the Space Shuttle, are launched to explore the depths of space. But it’s also a fun a place, where you can trip the light fantastic in zero-gravity nightclubs. One of the new generation of spacecraft from the alternative Lebanon of 2025. The programme was the brain child of Manoug Manougian, a professor of mathematics at Haigazian college, an Armenian college in Lebanon. Manougian’s interest in space travel seems to have been sparked, like many a child’s, by reading Jules Verne. Now teaching maths at university in Tampa, Florida, he says during one interview that it may not be accident he ended up there. Verne made it the location for his astronaut’s journey into space in his Voyage to the Moon as it was at the right latitude for launching a flight to the Earth’s companion world. Inspired by the achievements of the Americans and Russians, Manougian was inspired to begin his own experiments. He and a group of his students began making and launching a series of rockets. At first these were tiny ‘baby rockets’, not much larger than fireworks and about the same size as some of the model rockets hobby rocketeers enjoyed by hobby rocketeers. The rockets became increasingly larger and more sophisticated, until they reached the end of what could legally be built. The fuel used by the rockets was strictly limited to the armed forces. Furthermore, there was a problem with funding as any further increase in size would make the rockets prohibitively expensive for a small, civilian project. Manougian’s group had caught the interest of the Lebanese army under Captain Wehbe, who stepped in to give the young rocketeers the money and equipment they needed. The alliance with the army brought its own problems, however. Manougian and his students were only interested in peaceful research. The college’s founder, a Protestant pastor, was very much afraid that the rocket would be used as a weapon, and was initially strongly opposed to the research. He resolved to put a stop to it when he saw his own 12 year old daughter come out of one of the campus’ laboratories, her forearms grey from mixing the rocket fuel. He decided to go round and tell Manougian to put a stop to it. He was persuaded otherwise by the massive publicity the programme was giving Lebanon and his college. The newspapers were full of stories about Manougian and his band of space cadets. Other, similar groups sprang up elsewhere in Lebanon. One such was a group of 13-15 year old boys, who launched their own baby rockets. The Lebanese also received international assistance and co-operation from France and America. Col. Wehbe attended a course on rocketry and the American space programme in Florida. He also attended the launch of a French experimental rocket in North Africa. The programme was doomed by the political tensions in the Middle East. The film makers point out that the 1960s was a period of tension and conflict between the superpowers, America and Russia, and their allies and clients in the Arab world. Against them was Arab nationalism, led by the Egyptian president Abdel Nasser, which briefly resulted in the union of Syria and Egypt, and the anti-imperial forces. Lebanon was buzzing with spies and political intrigue. One of the speakers recalled how one frequent drinker at a hotel bar in Beirut was none other than Kim Philby, the notorious British traitor. The Lebanese’s success in building larger and more sophisticated missiles attracted attention and alarm from other nations. Their last missile was to have a projected range of 500 km, bringing into range Cyprus, Syria and Israel. Manougian’s rocketeers received a sharp message from their diplomatic staff in Cyprus. The British authorities were understandably annoyed after they made a mistake with one of their rocket’s trajectory, so that it almost landed on a Cypriot fishing boat. Other Arab nations were also keen to acquire Lebanon’s success and expertise. Manougian recalled how he was approached at an official party by another Armenian, whom he didn’t know. The man asked him if he was looking for funding. When Manougian said he was, the unknown man replied that he knew someone who wanted to meet him. And so Manougian found himself driving through Beirut with the man at 2.30-3.00 O’clock in the morning, before ending up at hotel, in front of which was a crowd of people. He was then approached by the heir of one of the other Arab states, who asked him if he’d like to come and do the same in his country as he’d done for Lebanon. Manougian states that he felt it would have been impolite to refuse the offer, and so simply replied that he’d have to think about it. He then fled back to Texas to complete his education, explaining that at the time he only had a B.A., and not even an M.A. With Manougian absent, the rocket programme began to experience a series of disasters. Three of the rocketeers were badly burned in an accident when the perchlorate rocket fuel being mixed exploded. The College decided the rocket programme was too hazardous, and so had them removed from campus. it was then gradually taken over by the Lebanese army. Manougian, Joseph Sfeir and the other leading rocketeers were peaceful visionaries, but the army made it clear that they had always been interested in developing it as a weapon. They just didn’t tell the project’s civilian leaders. Well, said one of the officers, if you told Manougian it would be all over Haikazian college, and if you told Sfeir, it would be all over his home province. Under the army’s control, the tests became more secret and closed to the public, unlike the earlier launches. Eventually the project was closed down due to international pressure. One of the rocketeers identified the French as responsible. Another recalled how he knew the then-president personally, and asked him, which country was responsible. ‘Was it from the north?’ he asked. ‘From the north, from the south, and elsewhere’, came the reply. Clearly Lebanon’s success at creating such a missile had made a lot of people understandably very nervous. The film laments how very, very few Lebanese now remember the programme, despite the massive publicity it had at the time. They feel that the 1967 War and the losses of Arab territory to Israel and subsequent conflicts have blotted out all memory of the programme, and made Arabs afraid to dream and strive for utopias. There is very little Science Fiction in the Middle East, they opine, because there’s always the danger that someone in the future will consider it subversive. What actually comes out of the film, in contrast to the militarism and political intrigue, is the peaceful idealism and patriotism of the projects leaders and founders. Manougian states that Lebanese Armenians are very loyal to their adopted country for taking them in after the Armenian massacres that occurred throughout the Turkish Empire and the Middle East. It’s a situation the film’s producers strongly sympathise with. One of them has an Armenian grandparent, while the other is part Palestinian. They see the space programme as what their country, and the Arab peoples themselves, can achieve if only they dare to dream and look for utopias. The film was made in 2009-10, during the Arab Spring, which they hail as the Arab people once more daring to dream of better societies without tyrants or despots. As for Manougian, he is still very much a visionary and campaigner for peace. He’s active in a project, ‘Peace through Education’. The film makers hoped by making the film they would restore its memory. The sculpture of the rocket was painted white to show that it wasn’t a real missile, and taken through the streets of Beirut to Haikazian College to show what Lebanon had achieved peacefully, through idealism. The film and its rocketeers remind me somewhat of the Ealing comedy, the Mouse on the Moon. This was the successor to the comedies about the minuscule state of Little Fenwick, an English village that manages to gain independence from the rest of the UK, Passport to Pimlico and The Mouse that Roared. The Mouse on the Moon chronicles the events as Little Fenwick joins the space race, rushing to land on the Moon ahead of the Americans and Russians. Apart from well-known Ealing stars like Margaret Rutherford, it also has Bernard Cribbins, known to grown-up children of a certain age as the narrator of The Wombles, and to a new generation of children as one the friends of David Tenant’s Doctor. It shows what small nations and ordinary people can do with skill, vision and military backing. Sadly, from the perspective of 2014 the film’s optimistic embrace of the Arab Spring seems misplaced. The despots throughout the Middle East have either successfully clamped down on the civil rights movements, or else the dissident movements themselves have led to the raise of dangerous and unstable Islamist militias. Egypt’s brief experiment with the democracy and the rule of the Muslim Brotherhood has collapsed, and the country is once more under the control of the army. Nevertheless, for a brief moment another world of peace and freedom seemed possible. The other point that comes out of the film is the amazing advances in science and civilisation when difference peoples and cultures come together in peace to try to learn from one another. Lebanon was known as the Switzerland of the Levant. It’s a mosaic of different peoples and religions, including Christians, Muslims and the Druze, a highly unorthodox form of Islam. Islam was able to make great strides in science in the Middle Ages, because the early caliphs were keen to draw on the knowledge and expertise of their empire’s subject peoples. The caliph Al-Ma’mun founded a bayt al-hikma, or House of Wisdom dedicated to science and medicine. They drew on Greek, Persian and Indian science and mathematics, and employed Christians, Zoroastrians and Hindus, as well as Muslims, to translate scientific and medical works into Arabic. Al-Ma’mun himself sent a scientific mission of scholars, including the pioneering mathematician al-Khwarizmi, who gave his name to word ‘algorithm’, to acquire scientific knowledge and texts from the Byzantine Empire, the Greek Empire of the East. Western science, in its turn, because massively enriched from the 12th century onwards when European scholars acquired copies of the lost Greek classics and Arabic scientific and medical texts. Peaceful contact between nations and cultures, and the great advances they could make by learning from each other, is now threatened today by the rise in militant xenophobia and, in the Middle East, by the genocidal Islamism of groups like ISIS. Bill Hicks sadly died of cancer, but the dreams lives on. Here’s the great man in action, taken from Youtube. A very worrying announcement has just been made by the Greek army Special Forces Reserve Union in Greece after increasing violence between neo-fascist Golden Dawn supporters and the government. He then gives a rough translation of the Reservists’ demands. The article can be read at http://tompride.co.uk/far-right-coup-in-greece-in-the-offing. Now this is extremely worrying, and should put everyone involved in left-wing politics in Europe on the alert. It looks like the army, or at least a section of it, once again wants to take power in Greece, just as it did in the 1970s. Their seizure of power was the result of a deliberate ‘strategy of tension’ planned and executed by Fascist groups and parties in collaboration with sympathetic extreme Right-wing elements in the state. One of the chief agents in this was an Italian neo-Fascist called Della Chiaei, who has to be one of the most vile characters ever to stalk the Post-War political fringe. Della Chiaei hated the post-War, bourgeois democratic Italian republic. He later said of himself that ‘others coloured their nausea with red. I coloured mine black’, meaning that like the extreme Left, he was sickened by modern Italy, but turned to Fascism rather than revolutionary socialism. Fascist ‘strategy of tension’ consisted in promoting political break down and establishing a state of emergency by infiltrating radical Left-wing groups and directing them towards terrorism. The resulting chaos and panic provides the Fascist sympathisers in the state with the opportunity of declaring a state of emergency, seizing political power and establishing a Fascist dictatorship with the consequent dismantling of any human rights or democratic political institutions. Della Chiaei began his career infiltrating a Bakuninite anarchist group, and encouraging them to engage in a bombing campaign. When his campaign of ultra-Right terrorism failed to result in a Fascist coup in Italy, he went off to do the same in Greece. The result was the military coup and the notorious ‘rule of the Colonels’. According to Purge’s article, the Reservists state that they are demanding these policies as a result of their battles with the Fascist Golden Dawn. Although the army’s opponents in this case are Neo-Fascists, rather than the extreme Left, it still seems very much to me that a similar ‘strategy of tension’ is being enacted there. And if it happens in Greece, it will start to happen elsewhere as well. Despite Mussolini’s initial statement, history has proved that Fascism is very much for export. Della Chiaei went all the way round the world, including to South America, working for extreme Right-wing dictatorships. I was talking about the current European political situation with a friend of mine a few weeks ago, and he was worried that were seeing the end of the democracy in Europe. Right-wing parties, and anti-immigrant and anti-Semitic organisations are on the rise all over Europe, from Jobbik in Hungary and the Front National in France. Some of this is simply a reaction to mass, extra-European immigration, particularly from the Islamic world. It is also a reaction to the failure of Neo-Liberalism to provide jobs and opportunities for the poorest in society. Capitalism appears to have failed, Communism was discredited when the Soviet Union collapsed. Many of the European Socialist parties have taken over Neo-Liberal policies to a greater or lesser extent. The Financial Times reported in its magazine right at the beginning of the Millenium in 2000 that many Germans were disillusioned with the Socialist SPD in Germany following Gerhard Schroder’s cuts in benefits. The result is that for some disaffected Europeans, the extreme Right becomes a credible political alternative, and a channel for their resentment at a global economic order that has no time for them. At the moment, with the exception of the Front National and Hungary’s Jobbik and, to a lesser extent, Fidesz parties, the explicitly Fascist parties in Europe are miniscule. The actual long-term membership of the BNP in Britain is minute: about 200 people. Most of its recruits leave after about 2 years, as by and large they have no interest in Fascist ideology. They join it mostly because from an hostility to non-White immigration. The problem is, the Nazis were also a fringe policy until the financial crash of 1929. In an interview on the BBC Alan Moore, the writer of the V for Vendetta graphic novel, said that he was worried about the current government. This wasn’t because the Coalition were Fascists, but because the current austerity programme mirrored Weimar Germany. While I disagree with many of Moore’s views, here he is absolutely right. The news of a possible coup in Greece is extremely worrying. We urgently need to guard against its emergence there, and in the rest of Europe. This is another highly thought-provoking piece from Mike detailing the similarity between the Condem regime and the fictional, Fascist Future in Alan Moore’s graphic novel and movie, ‘V for Vendetta’. The parallels include the involve of Big Business in an autocratic regime, deliberately racist policies aimed at racial minorities, gay men and women, and the use of humans for medical experimentation. All of this occurred under Fascist regimes, and particularly and most notoriously under Hitler’s Third Reich. It is also happening in Greece today, and coming back in Hungary under the Fidesz and Jobbik parties. Much of ”V’ for Vendetta’ also reflects the time it was written: the era of Reagan and Thatcher. Both of these back extreme, Right-wing dictatorships, particularly in South America. Thatcher’s Conservative party also had extensive link with the Far Right, both at home and abroad, as extensively documented by the parapolitical magazine, Lobster. It was also the period when the use of Nazi scientists by post-War American administrations, and the knowledge they brought with them was also being increasingly uncovered and the subject of controversy. The most famous of these were the rocket scientists brought to America under ‘Operation Paperclip’. It also included medical information acquired from the human experimentation in the concentration camps, some of which had been used for teaching purposes in British medicine. FOI releases later revealed the extent of human experimentation by American scientists and doctors in the post-War period. In Britain the prospect of anarchy and social disintegration in the 1970s saw the formation of extreme Right-wing paramilitary groups, formed to seize power and clamp down on Left-wing unrest. Francis Wheen’s book on paranoia in the 1970s, ‘Strange Days Indeed’ shows how widely this fear of a left-wing takeover was in establishment circles. The Times, for example, demanded the formation of a coalition government of national unity, formed from the middle of the road of the three main parties. Other members of the establishment openly supported the formation of the Right-wing paramilitaries and their plans to seize power. The 1970s had also seen the rapid rise of the National Front to the position where, by the end of the decade, to many people it looked set to take over from the Liberals as Britain’s third political party. This made the Fascist future described in Moore’s comic strip extremely plausible. It was Science Fiction as ‘the literature of warning’ of an all-too possible future. The government of the USA is based partly on Rome’s model, which is centuries older than Jesus. Direct democracy existed in Athens, Greece centuries before Christ was even born. Christianity was a speedbump for Western democracy, not it’s origin. Let’s deal with the individual statements in the post. I don’t dispute that. Indeed, I say that the Patristic writers, such as St. Augustine, took their contract view of the origins of society from classical writers, like Plato. Furthermore, when constitutional writers and political theorists like Algernon Sidney went on to discuss these issues in the 17th and 18th centuries, they frequently made use of events in the classical past. Sidney uses Roman history to justify popular rebellion against a tyrant. The anonymous author of England’s Misery and Remedy cites classical authorities, such as Camillus and Pliny. So no, I don’t actually deny that modern democracy is based on ancient Roman and Greek precedents. However, there are strong differences between ancient democracy and our own. Ancient Greek society was strongly oligarchical. Women, slaves and resident aliens – metics – did not possess the right to vote. Neither labourers, artisans or merchants. When Aristotle talks about democracy in The Politics, he actually refers to the condition where the vote is still restricted to individuals with incomes from their land, in other words, leisured gentlemen. He did not believe that the hoi polloi – ordinary people, who had to work for their living – should have the vote as they did not have the time or education to devote to politics. Firstly, this assumes that the autocratic character of medieval and early modern politics was solely due to Christianity. This is not the case. Christianity may have reinforced the power of the king through St. Paul’s dictum that rulers should be obeyed, but democracy or popular politics had declined in the ancient world before Christianity became the state religion. To most people in the early modern period, when modern theories of government were being formed and constructed, democracy was a failed experiment. It was associated with political instability and civil war. If you remember, the first Roman Emperor, Philip Augustus, took power after a series of popular rebellions, which he put down. He closed the political clubs, though to prevent anyone becoming suspicious of his own political ambitions, called himself ‘First Citizens’ – princeps, rather than a title like ‘king’. The period of democracy in Athens was actually quite short-lived, perhaps only twenty years or so. More recently a book has been published stating that the ancient Greek’s legacy to medieval Europe wasn’t democracy, but sacral kingship. As for medieval feudalism, Fernand Braudel and other historians of medieval European society have shown that it arose through the retreat of the ancient Roman senatorial aristocracy to their estates on the one hand, and the military aristocracies of the invading barbarians on the other. Economic and social forces from the Second Century onwards worked to force the free Roman classes into a position where they were no better than slaves. The result was the rise of feudalism, where political power and military service are collapsed together in the power of the local landlord. By the 16th century, the view had arisen that nations were free to choose whichever system of government most suited them. However, they felt that monarchy was the best, as it gave the king absolute power to check dangerous rebellions and threats to public order. In practice it was expected that the monarch would not do so, and would respect his subjects’ liberty and property. The Reformation and Wars of Religion brought issues of government, its forms and the power of monarchs and their legitimacy to a head. As a result, theologians and political philosophers drew on ancient and Biblical history to explore these issues, and this included arguing for representative government and popular liberty. So no, I don’t deny that modern American democracy is ultimately based on that of ancient Greece and Roman. However, these classical precedents were revived, modified and expanded in the largely Christian culture of late medieval and early modern Europe.